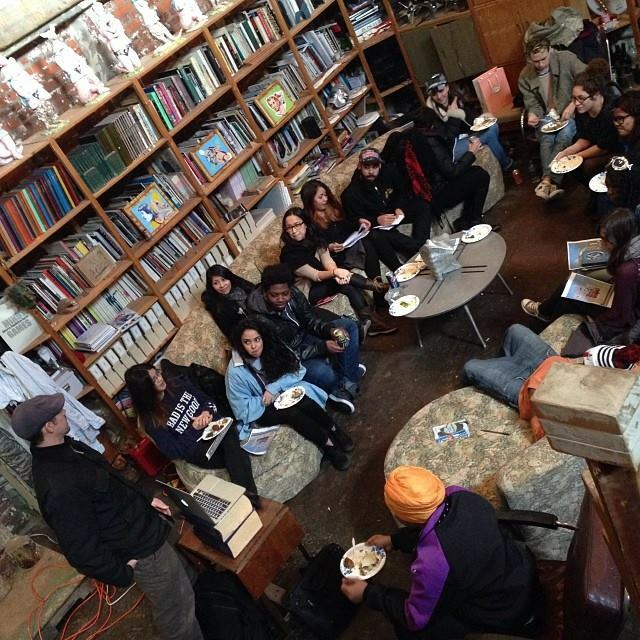 Earlier this winter, Cre8tive YouTh*ink hosted a pre-production planning party at Ray Smith’s sprawling Studio in Gowanus, Brooklyn, to gear up for The Art School Without Walls, Vol. 6. Cre8tive YouTh*ink is a New York City-based nonprofit creative-arts youth-development group founded by Jerry Otero. The Art School Without Walls is Cre8tive YouTh*ink’s initiative to place inner-city youth under the apprenticeship of established artists to create collaborative works of art. Five projects have been completed to date, including a mural for the Bronx Museum of Art and most recently, a series of murals for the New Museum’s Ideas City Festival in 2013. The next project, a collaboration with the Quinlan Development Group and Lonicera Partners, will be led by renowned street artists Christ Stain and Billy Mode. Stain and Mode will guide 12 artists (ages 15-22) in Mural and Printmaking workshops to produce a large-scale mural that will appear on a new building at 267 Pacific Street in Brooklyn this Spring. 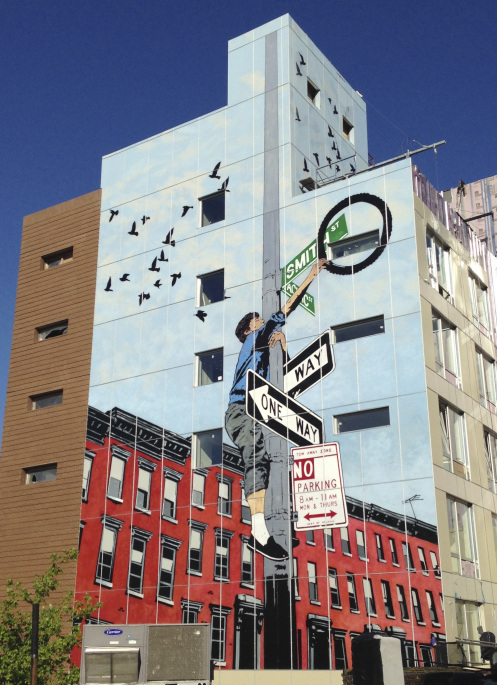 The mural is based on an iconic image from ” Street Play Project,” a collection of 1970s photos by Martha Cooper that highlights the creative spirit of New York City’s inner-city residents. 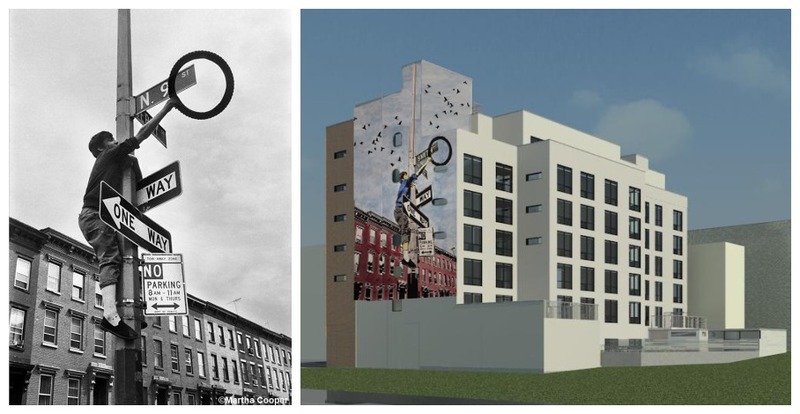 Left: The chosen photograph for the upcoming mural from Martha Cooper’s “Street Play Project,” depicting a teenager who scavenged the city for bicycle parts to craft his own stylized inventions. Right: Chris Stain’s interpretation of Martha Cooper’s photograph for the mural that will be placed on a new building on Smith St. & Pacific Ave this Spring. At the planning party, Stain met his 12 new apprentices for the first time, along with the social media interns (us!) who will be documenting the mural’s creation along the way. He presented a slideshow of images of his earlier work and discussed how he became an artist, which began when he was an inner-city teenage graffer in Baltimore in the 1980s. First he talked about some of his techniques for creating street art, such as stenciling which he is best known for, and how he continuously aims to create the same esthetic in larger pieces. Stain also opened up about the more personal details of his life as a graffiti artist, including his scrapes with the law. The artist stressed the ephemerality of graffiti as both a strength and a weakness in the medium. It is rare for a work of street art to last very long without being buffed or tagged by other artists. While this can be frustrating at times, it also ensures that street art always remains relevant to its location and of its moment. Stain recalled a particular piece that took two weeks to create and was buffed only two weeks after that. Stain used this point to illustrate why photography and documentation are so important to street artists and how photojournalists like Martha Cooper help preserve its memory. 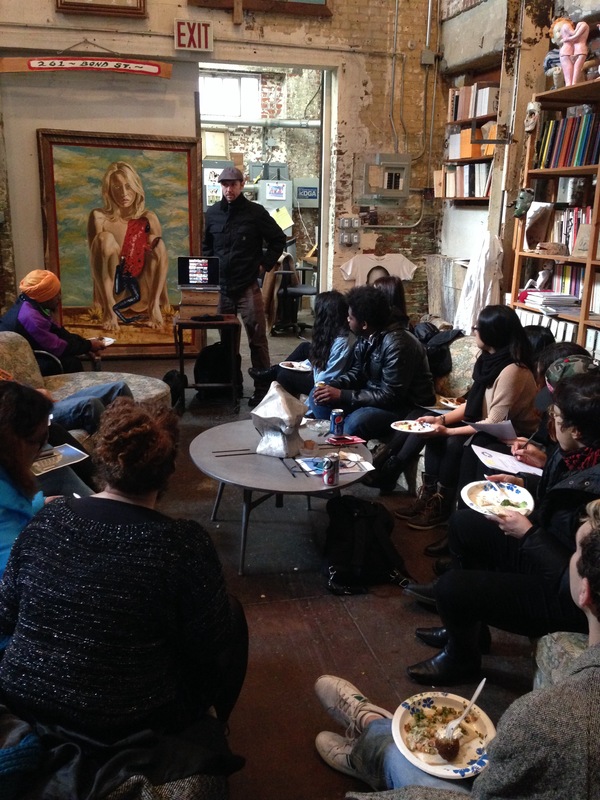 Chris Stain shares his childhood and early work in Baltimore with the group. After discussing his own background, Stain asked for everyone in the room to introduce themselves and to share some of their own stories as artists and city kids. Going around a full circle, each person divulged how they became involved with art. Everyone had been involved with Cre8tive YouTH*ink before, and some of the original artists are now working as leaders and mentors to the newer members. Trying to stay positive while growing up in tough neighborhoods was a shared bond they all had with the artist. One member, Vince, said that he loved The Art School Without Walls because it allows him to express who he really is. “You go to art school and they try to take you away from yourself,” said Vince, who joined the team when he was still a high school student and now attends Parsons. Chris Stain, who took the time to respond to each member individually, said, “You don’t go to art school to become an artist; you go because you are an artist and want to sharpen your skills.” He recounted a recent time when his work was harshly criticized by an art teacher despite the fact that his art was already being shown in well-known museums around the world, reminding the students to not let the opinions of others weigh on them. Another member, Dan, agreed and added that his inspiration had to come from himself because it couldn’t come from the hood where he grew up. “I use art as an escape realm because if my mind is focused on art, it can’t be focused on the negative. While I’m drawing, I can get better, while others might get worse,” he said. Chris Stain meets the team. Though he never planned on becoming a teacher, Stain loved it once he began. He has a passion for working with inner-city youth and believes that it’s vital for street art to represent the narratives of the people. He chose an image from Street Play because it shows how people can make something beautiful from almost nothing. He pointed out that he always adds birds to the picture he uses for his graffiti to symbolize hope, especially in the inner-city. Stain is currently attending Queens College for a degree in Art Education.